The ID Tech AccessMag has been discontinued. No direct replacement is available. The AccessMag is for access control and unattended applications. It features a unique mounting design, sleek footprint and reading reliability makes it suitable for many other related applications. The AccessMag is front mounted using the mounting base and clamshell housing. The wide reader slot enables easy passing of laminated cards and the head mount sheds water and minimizes seepage into the housing. The reader also supports three LED's which are used for ready, card accept and card reject indications. 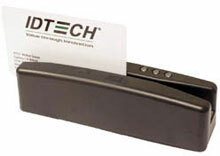 The high speed circuits decode fast speed card swipes, normal at access control locations. Track 2, RS-422 interface. Includes power supply & RS-422 cable. Color: black.